Just three contenders remain in hunt for $8.8 million in the 2018 WSOP Main Event. Miles: "I'm always telling him one day you could win life-changing money." Hand #75: Action folded to the small blind, where Aram Zobian shoved all in for 17.35 million. Big blind Michael Dyer called fairly quickly with . Zobian had a dominated and needed help. The flop brought nothing for Zobian besides a backdoor diamond chance. The ended those hopes so he needed a six. The river didn't do it, eliminating Zobian in sixth place less than 20 minutes into the penultimate day. Hand #105: Cada raised under the gun to 2.2 million and Tony Miles made it 6.9 million on the button. Cada moved all in for 47.65 million. After several minutes in the tank, Miles called with . Cada turned over and it was a race for about 85 million. John Cynn raised to 2.1 million from the under-the-gun position and got called by Tony Miles on the button and Dyer in the big blind. The flop came , both Dyer and Cynn checked. Miles bet 4.3 million. Dyer raised to 14.3 million. Cynn quickly folded. Miles considered his options and decided to call. The was brought on the turn. Dyer now took the initiative and bet 21.4 million. Miles called after a minute or so. The completed the board on the river. Dyer now opted to check. Miles decided to bet 27 million and Dyer snap-called. Miles tabled for the flopped set of treys and even improved to a full house on the river. 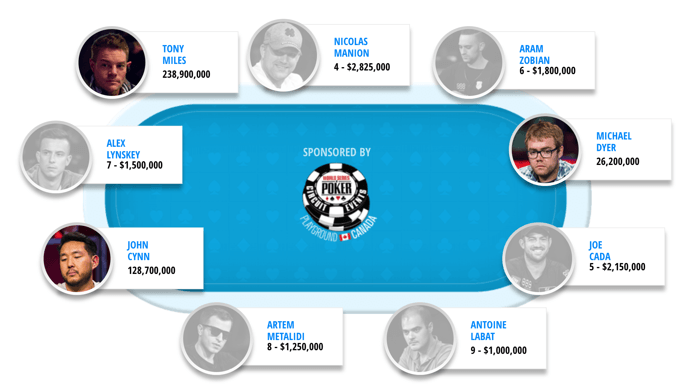 Cynn made it 2.4 million from the button and Nicolas Manion defended big blind. On the flop, Manion fired out 3 million. Cynn called, bringing the . Manion kept up the aggression with 5.5 million. Cynn called and the river was an . Manion jammed for 11.2 million and Cynn quickly called with for a flush. Manion was forced to show his . 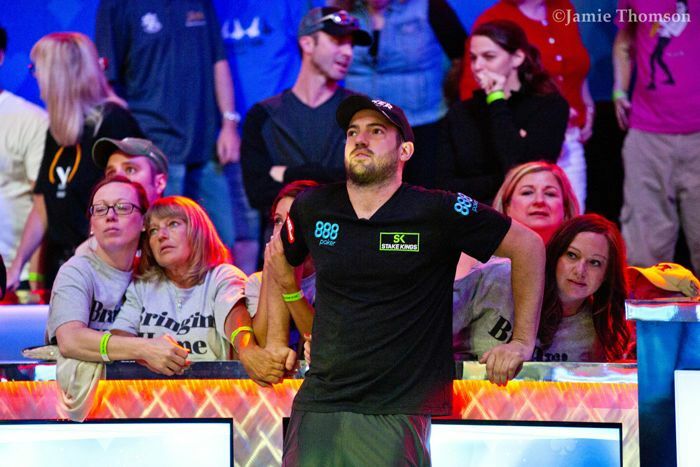 Michael Dyer raised to 2.4 million on the button and Tony Miles defended his big blind with a raise to 9.6 million. Dyer peeled and flopped. Miles bet 9.5 million and Dyer called. The turn was the . Both checked, bringing the . Miles fired 27 million. Dyer tanked a couple of minutes and called, losing showdown to .